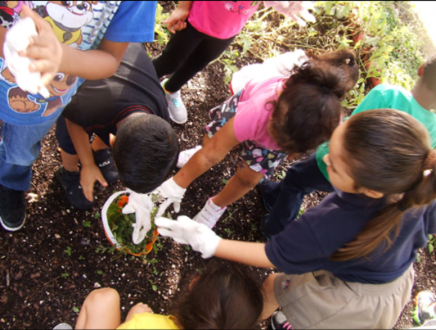 Liliana Mejia, director of Kinder Land 4 Kids Childcare Center in Miami-Dade County, Florida, achieved her action plan goal of creating a garden in order to introduce vegetables and fruits to her students during snack time. To achieve their goal, Liliana asked for donations of different seeds and plants from parents. The children tended to the garden daily as part of their science classes and had a great time using gardening tools, handling and learning all about dirt, and learning techniques to nourish and harvest plants. From the teachers’ perspective, the children enhanced their skills in problem solving, developed sensory and motor skills and learned patience as they eagerly waited for their garden to bloom. In the month of April, the garden was in full bloom and parents and children were invited to eat the fruits and vegetables. The garden produced carrots, tomatoes, peppers, and personal achievement in the children. A big salad with all the produce grown in their garden was created and everyone had a chance to enjoy the fruits of their labor. Arlington Christian Academy in Florida built an outdoor classroom where children have the opportunity to not only learn about growing food but also to increase their consumption of fruits and vegetables by eating the produce that they harvest throughout the year.